There aren't many wrecks to dive in Hawaii, at least not that endure very long. This is mostly because the islands are the unprotected, tipity-tops of enormous underwater mountains. The seascape is quite exposed to the elements, especially the Big Island, as it is relatively new land and it's very few bays lack much natural protection from natural currents and storms. It is also the reason there aren't very many soft corals. 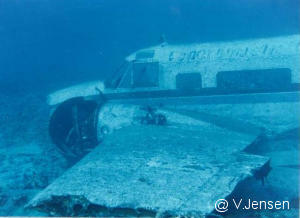 This 12 passenger Beechcraft landed in the ocean a couple of miles north of the Kona-Keahole airport right after take off late '83 or early '84. Everyone got out ok except for one woman who couldn't release her seatbelt. As luck would have it, some fire rescue guys were fishing near the crash site on their day off. I heard that the man who saved her got his gear on and hit the water almost the same time as the plane. Their boat picked everyone up and thankfully, no one was seriously hurt. 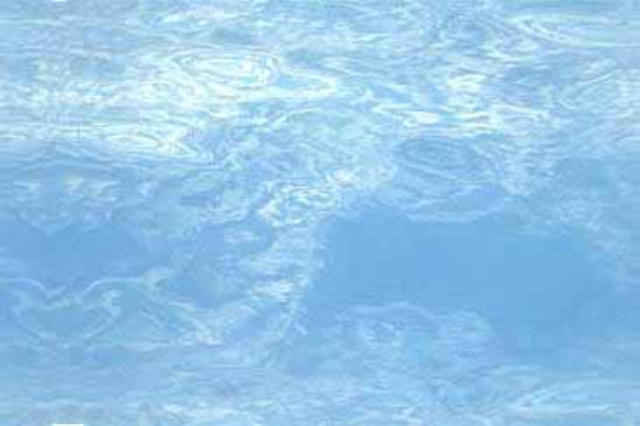 After that it lay where it had gone down in 25 feet of crystal clear water with the words "PANORAMIC AIRTOURS" printed across the length of the fuselage in plain view of all the airlines coming and going to Kona. Since this wasn't very good PR for Panoramic Airtours, a salvage attempt was made by a helicopter with a cable. The cable snapped nearly bringing down the chopper. Needless to say, that method was abandoned. The owner of one of the dive shops had some salvage experience and managed to get the "ok" to float it with lift bags and sink it in deeper waters as a dive site. They intended for it to set down at a depth of about 80 ft., but whatever current and the aerodynamics of the wings caused it to sail down to about 115 ft. If you know a little about diving, you know that the deeper the water, the shorter the dive to avoid the bends; but I think it would have deteriorated quite a bit faster in only 80 ft. of water. I took this picture on my first trip to dive the plane. As fuzzy as it is, I consider it to be a pretty lucky shot considering the depth, the fact that I'm aiming down and so not what you would call "taking advantage of available light", and that it happened to be right when the guy outside of the plane was in the process of taking a picture of another diver inside the cockpit. 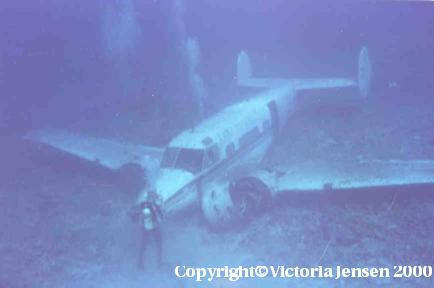 The plane was still very much intact the first few times I dove there, windshield and all. The windshield was the first thing to go. 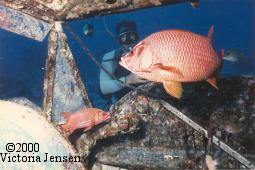 Two large red soldier fish took up residency in the cockpit and a good sized yellow margin moray eel moved into the right wing. I took the shot below from inside the plane of the largest soldier fish in front of the controls and my instructor/friend/boss, just outside of where the windshield had been. Sometime later after a storm the tail section broke off at the doorway. It has lasted for several years. Even with the deterioration, as long as you take a frontal shot it still looks very much the same. Once we took a family there for the deep dive of their advanced course. Somehow all 5 of them got inside and crowded into the cockpit while I took their picture from outside. It was such a great, crack-up shot. I began duplicating the first shot above over time through it's various stages. It's been 4 or 5 years since I've done a dive there so I don't know how much of it is left. One of the things I think that made it so delightful to go there was the fact that no one was hurt!